Beirut has its Corniche, Havana its Malecon, Cannes its Croisette; but none of these celebrated bayside boulevards is as heart-stirring as Mumbai’s majestic Marine Drive. Sidharth Bhatia delves into its history. The no. 123 double-decker bus used to run the most popular route in Bombay. Even those who didn’t live or work along its path loved it. It was a favourite with young couples, who would clamber aboard, rush to the upper level and settle down for the city’s most scenic ride. For on its way to and from Colaba at the southernmost end of the peninsula, the 123 trundled along Marine Drive between the vast expanse of the Arabian Sea on one side and some of the most beautiful buildings in the city on the other. 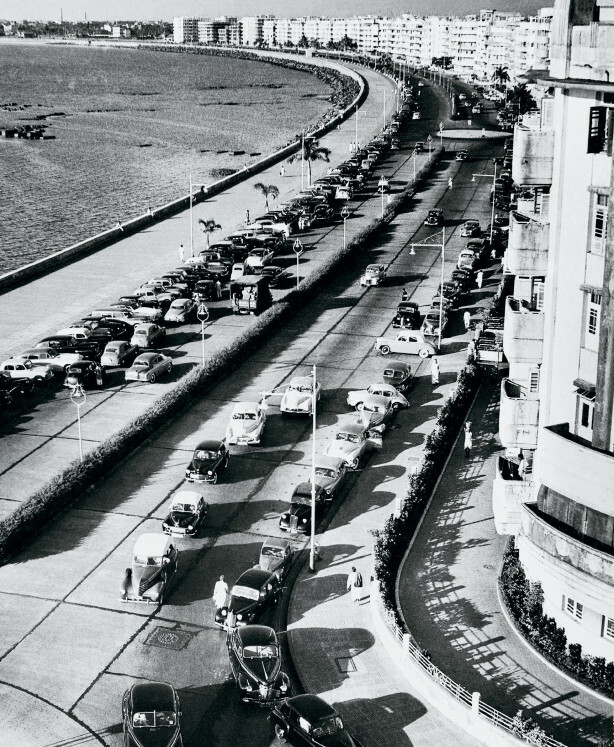 That view of the promenade, the bay and the magnificent Art Deco structures that line the drive was one of the great bargains of Bombay – until some sourpuss bureaucrat stopped the double-deckers from plying the route. Still, Marine Drive is where Mumbaikars come for a few moments of freedom from the stresses of commuting, of high living costs, of cramped homes. It is a place that breathes possibility. Bollywood filmmakers have long exploited its majestic arc to show Bombay as a city that sets you free. Amitabh Bachchan likes to recall the time when he slept on a Marine Drive bench at night. Years later, many of his films were shot here. In one, Muqaddar Ka Sikandar, he rode a motorcycle down the road, rakishly dressed and singing with abandon. It was a statement of having finally arrived, proof that having made it in Bombay you can make it anywhere. After all, as the song from the 1956 film C.I.D. goes: “Ae dil hai mushkil jeena yahan, zara hatke, zara bachke yeh hai Bombay meri jaan.” (Oh my heart, it’s very difficult to live here, be careful and be warned, this is Bombay, my love.) The song subsequently became the de facto anthem of this tough metropolis. The three-kilometre stretch along the waterfront extends from Nariman Point to Chowpatty, disappearing into Walkeshwar and, beyond that, tony Malabar Hill. The famous Art Deco, buildings, however, run only along about one third of the drive; after them come the gymkhanas with their open cricket fields, followed by a run-down aquarium, a modern tower block that is a hostel for female students, and at the far end, Wilson College, built in 1889 in the Victorian Gothic style. The apartments that overlook the drive house the wealthy; the promenade is more egalitarian, a wide stretch of pavement where locals and tourists, rich and poor, young and old, portly businessmen and indigent students all mingle to “eat the breeze”, as the Hindi phrase goes. Young couples turn their backs on the world, cuddling and kissing, unmindful of the throngs behind them, throngs who generally leave them alone. In claustrophobic Mumbai, where privacy of any kind is at a premium, Marine Drive affords anonymity. Here, at least, Bombay lets lovers be; in any other Indian city they would be routinely disturbed and harassed. Dhun Lentin (née Patel) is among the lucky few who live on the top floor of one of Marine Drive’s celebrated Art Deco apartment buildings. Her family moved to a fourth-floor flat in the brand new Soona Mahal building in 1939 when she was five. It was a grand, three-bedroom affair with a curved balcony facing the south-western seafront. Soona Mahal was on a corner plot, with attractive windows running down the front and a circular penthouse on the terrace. On the ground floor is the popular music-filled restaurant Pizza by The Bay (formerly called Talk of the Town) well-known for the political banners its owner flies above the corner. The Patels were among the earliest residents of what was then a smart new address for the Bombay elite. The old money was in neighbourhoods like Malabar Hill, where high-ranking British officials and long-established wealthy Indian families lived. But by the early Forties, Marine Drive was becoming a preferred quarter for more modern families, Indian and European. Dhun Lentin has lived all her life on Marine Drive. In 1961, she married a young lawyer who lived just four buildings up the road. Bakhtavar “Bomi” Lentin’s home was a sprawling, 2,500 sq.ft. sea-facing apartment on the fifth floor of Chateau Marine, built by his grandfather. Chateau Marine is a name that evokes instant recognition among old Bombay residents, especially those who know their popular film history. While Lentin himself went on to become a famous judge in the Bombay High Court, across the landing from his flat lived his childhood friend, a young gawky girl named Fatima. In time, Fatima would adopt the name Nargis and the world would hail her as one of Hindi cinema’s greatest stars. The home that Nargis lived in as child and young woman was presided over by her formidable mother, Jaddan Bai. She herself had been a well-known singer before becoming famous for her salons where actors, writers and producers, all hopeful of working with Nargis, assembled and paid court. The acerbic Urdu writer Saadat Hasan Manto regularly attended these events. He recalled of his visits to the apartment in what he once called “Bombay’s most luxurious area” how JaddanBai used to discuss each and every detail of the films that her daughter would star in and kept a tight control over her money. During the 1940s and 50s, gaggles of fans used to stand outside these two buildings, hoping to catch a glimpse of their favourite stars. The Marine Drive homes of both these actresses played a key role in their own lives and stories about them have become part of Bollywood lore. The first meeting between Nargis and her long term co-star and lover Raj Kapoor took place when she opened the door of her flat to let him in. Her hands were full of flour because she had come straight from the kitchen where she was making chappatis. Kapoor used the scene for a sequence in his film Bobby. The real-life drama at Krishna Mahal was even more intense. Suraiya’s handsome beau Dev Anand used to come to meet her under the watchful eye of her “grandmother” (she was in fact her mother). When their affair finally broke up, the emotional young actress crossed to the promenade and threw his ring into the sea. Marine Drive’s charm and hold on the collective imagination goes beyond such Bollywood legends of course. Its deep, graceful curve is perhaps the city’s most famous image (after the Gateway of India and the Taj Mahal Hotel) celebrated on millions of postcards, tourist brochures and in scores of films. The romantic glitter of the long arc of streetlights – “the Queen’s necklace” – cannot be found anywhere else. A distant, if slightly hazy personal memory surfaces here from the late 1950s: I remember walking from Churchgate to Marine Drive and down towards the end of the promenade where the Oberoi Hotel stands today. The business district of Nariman Point did not then exist. The seafront tapered off into a jagged strip of land where every Sunday crowds used to gather to watch films projected onto a giant concrete screen. For a little Bombay kid, this was the highlight of the week. I remember vividly how busy Marine Drive was on Sundays even then. In a city starved of space, it was the one open expanse where everyone could gather for a few hours and feel liberated. Its openness to the sea and to lands beyond mirrored the city’s traditional willingness to welcome people, ideas and influences from everywhere. Like many a development in Bombay/Mumbai, Marine Drive owes its existence to land reclamation and profiteering. From its early origins as a British trading outpost to its messy, chaotic present, the city has undergone several stages of reclamation: first to join together the seven islands that constituted it and then to keep expanding out into the water. Successive rulers dreamt up their own ambitious projects; investors and speculators were quick to move in. The familiar nexus of politicians, administrators, moneybags and fixers conspired behind closed doors, justifying their plans in the name of urban development. One such push came at the turn of the 19th century when, after a devastating outbreak of plague, the British administrators decided to decongest the city and to reclaim land at its southern end. The Bombay City Improvement Trust began with the reclamation that became Cuffe Parade. It was successful enough to inspire a more ambitious plan on the Backbay. It was not an entirely new idea – something on those lines had been thought of in the 1860s but was abandoned in the economic crash that followed the American Civil War. 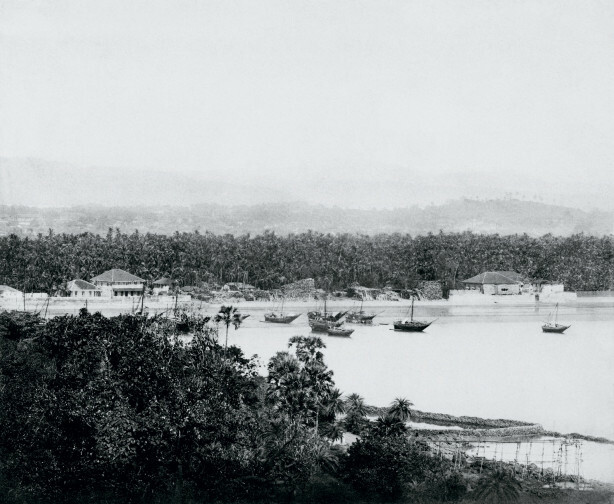 Unobstructed: Panorama from Rajabai Tower looking south, by Raja Deen Dayal, 1880’s. Watson’s Hotel is on the left, the Secretariat building at centre. At far left in Colaba is the former Royal Alfred Sailors Home, now HQ of the Maharashtra State Police. The new scheme envisaged reclamation all along the western side of the southern tip of the city, a beautiful promenade that would not only have apartment blocks and office buildings but also public squares in the manner of Oxbridge quads. The homes were to be for the rich, but the proposal was marketed as if it would somehow decongest the crowded “native” areas. However, British administrators balked at cost estimates made in the first two decades of the century, and the Indian-dominated municipal corporation opposed an increase in the housing stock that might lower rents. Nevertheless, after private money moved in, the project began to take shape. The Backbay reclamation scheme began in 1919. Stone and mud were quarried in the north in Kandivali, brought by train to the site and dumped into the sea. But the whole project was badly planned, the dredging of the sea inadequate. Soon there was no hope of finishing the project within five years, contrary to what investors had been told. By the early 1920s it was clear that the development plan was a disaster. The scandal led to an official inquiry. Leading the public outcry was the nationalist lawyer Khurshed Framji Nariman. He wrote strident articles in the local press, whose headlines lambasted the reclamation plan as “Lloyd’s folly” and “Buchanan’s blunder” after the governor and engineer he blamed for the bungling. (Decades later, the new business district in south Bombay was named after him, an ironic twist given that there was a stench attached to this project too.) The government recommended that only four of the eight planned blocks should be reclaimed. The result can be seen when one stands at the jetty-like strip that juts out into the sea at Nariman Point and gazes at Cuffe Parade across the gap. Had it been filled in, Marine Drive would have been much longer. As it was, 16.6 acres emerged from the sea opposite the imposing Gothic headquarters of the Western Railway and Churchgate station, which had until then been on the waterfront. Throughout the 1930s, modernist buildings – cinemas, offices and apartment blocks – began to rise: Eros cinema with its ziggurat, Liberty cinema with its piano keys running down the wall, New India Assurance building at Fort with its Indian motifs and friezes. All these buildings, which are such a strong part of the city’s identity, were conceived and built during that period. The style we now know as Art Deco had already taken the world by storm – the seafronts of Miami, Alexandria and Havana all had a particular affinity to the style – Bombay would be no different. And Bombay Art Deco was more than just a design fad. For a newly emerging Indian elite (as well as royalty from all over India who rushed to buy properties on Marine Drive), it represented a breakaway from the grand Gothic and Indo-Saracenic imperial buildings that dotted the southern tip of the city. Indian merchants, financiers and professionals were implicitly rejecting the architectural ethos of the Raj and seeking a style that expressed their aspirations. Art Deco’s reinforced concrete and stucco fronts, its curving balconies, its absence of ornate Corinthian columns, and the idea of being connected with the latest international design trend all appealed to them. An Ideal Home exhibition held in Bombay in 1937, showcasing the latest furniture and decor styles, was a triumph; the new look, with its curved steel sofas and chairs, was perfect for these stylish apartments and the modern families who would live in them. Some of the names tell stories. The trio of identical buildings named Kewal Mahal, Kapur Mahal and Zaver Mahal were named by a wealthy Gujarati cinema tycoon after himself and two of his children. Al Sabah Court, on the other hand, was owned by the Kuwaiti royal family and was the home of a young prince during the 1950s. The way we were: Marine Drive in the 1940’s or 50’s taken by the celebrated Bombay photographer A.L Syed. A cricket match is probably the reason for the unusually large number of cars. As well as apartment buildings, there were new hotels and boarding houses. Sea Green South Hotel was commissioned by the army and the security services during the Second World War. The Natraj Hotel (now the Intercontinental) was originally the site of the Bombay Club. A place of leisure and residence for its British members, it was all Burma teak panelling and leather armchairs. There were also many boarding houses for bachelors, offering breakfast and dinner, with names like Chambre Deluxe, Continental Guest House and Norman Guest House (which is still in business). Marine Drive was the place to be. Newspapers of the early 1940s are full of ads seeking “high-class tenants” for “ultra-modern” flats. Some made it clear that “Europeans only” were preferred. However, the impressive and glamorous new apartments were expensive – the rent was around 250 rupees a month, way beyond the means of most citizens. Present-day Bombay residents might be astonished to learn that Marine Drive’s new buildings were not at first in great demand: “I remember the buildings had boards announcing ‘To Let’ prominently displayed. Tenants were hard to come by and were very fussy,” says DhunLentin. Her grandfather-in-law, the builder of Chateau Marine, grew fed up with the constant demands of tenants who often used to rent only for a few months – mainly during the monsoons, to see the rains – and then insist on the rooms being painted to their taste. “He thought it was a losing proposition and sold the building to the then Maharaja of Baroda whose family still owns it.” The Lentins became tenants in the building they had constructed. But the apartments were too attractive to remain ignored for long. As talk of Partition grew, wealthy Hindu families from the Pakistani side began moving to Bombay. “We used to see rich Sindhi women, dressed in fine shiny saris and wearing their diamonds prominently, walk down the promenade. They loved Marine Drive because it reminded them of Karachi.” A settled old order was giving way to a new one. The buildings began filling up. While the British and the Europeans, many of them emigrés from a war-torn Europe, started to return home, the newly arrived Indians rushed to move in. Soon it became difficult to find a good flat at Marine Drive. The buildings were not only convenient, beautiful, well located, spacious and modern, but nearby Churchgate Street had become the epicentre of Bombay’s nightlife – restaurants, bars, jazz clubs – and the commercial district was within walking distance. Bombay was enjoying its own gilded jazz age, with bands from all over the world swinging at the watering holes run by their European owners; a Marine Drive resident could just walk to any of them to soak in those music-filled evenings. The new tenants also came to enjoy another advantage. The Bombay Rent Control Act was passed in 1947 and for decades after the rents were frozen at those levels. Even today some of the original tenants live in commodious apartments of up to 3,000 sqft but pay sometimes as little as 300 rupees a month. Landlords have accordingly lost the incentive to refurbish, renovate or even paint their buildings. Many apartments are locked in litigation as the landlords try to get their tenants evicted. Some owners worked out deals with their tenants and sold the flats—inevitably, those buildings look better maintained. But all too often the buildings, hit by decades of salty sea breezes and shoddy upkeep, are in extremely poor shape. Residents complain of poor plumbing, rickety stairs and lifts, and balconies that could fall off any day. The general visual impression is one of frayed gentility. 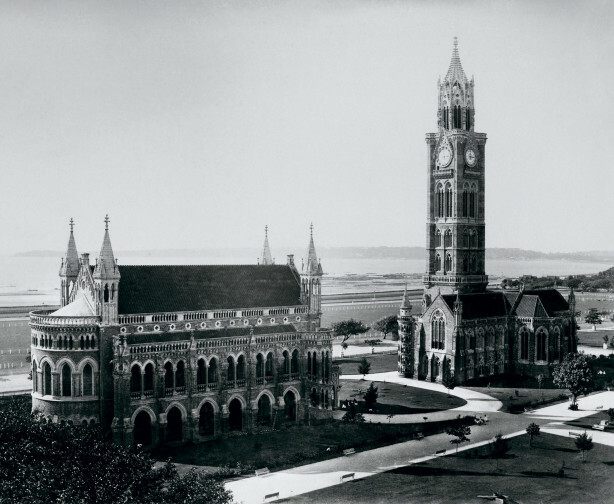 Splendid isolation:This shot of Bombay University’s Clocktower and Convocation Hall, with the sea behind them was probably taken from Watson’s Hotel around 1878. These Gothic structures, funded by the philanthropic bankers Premchand Roychand and Sir Cowasji Jehangir Readymoney, were among the city’s first great buildings. Not surprisingly, the older tenants see no reason to give up their apartments. This has meant that newer owners and tenants do not move in; they find the buildings old and decaying and the legal problems intimidating. Real estate prices for Marine Drive – assuming that anyone is ready to sell out – are much lower than those of other posh areas. For nostalgists like me, with long memories, Marine Drive is as magical as ever. But I wonder if the brave new inhabitants of this ever changing metropolis feel the same way. To them, it may seem a relic of the past, not the symbol of a globalised Mumbai. Given the chance, someone with serious money to spend might not necessarily want to live here – in gracious old apartments that cost $2 million or more but where there is no space to park one’s car safely. Do youngsters dream of making enough money to move into a Marine Drive flat one day? Difficult to say. It is pleasant enough to be in a neighbourhood where the pavements are free of hawkers and which offers a glorious vista as part of the deal. But anyone can get that sea view for free. That vista, part of and yet so different from the rest of Mumbai, calls out to us even today. Nothing else in the city compares with it. Take a stroll down the promenade and feel your heart sing out. This article has been reproduced with the permission of The Indian Quarterly and the author. Sidharth Bhatia is the founding editor of The Wire (www.thewire.in).